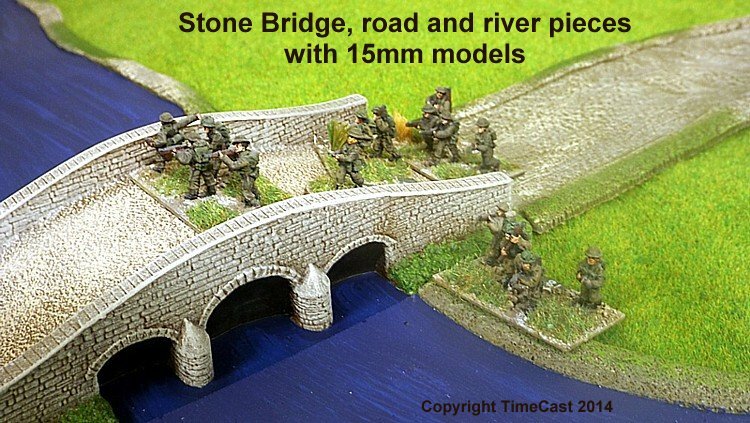 The terrain, which includes roads, rivers, fields, marshes, ponds/lakes and paddy fields, are made in a lightweight flexible latex rubber, which is both detailed and easy to paint. Because of the variable size of different features in the real world we have chosen not to assign specific scales to all of the models in this range. Individual models may therefore fulfill different functions depending on your scale of models and figures and the ground scale you are using. 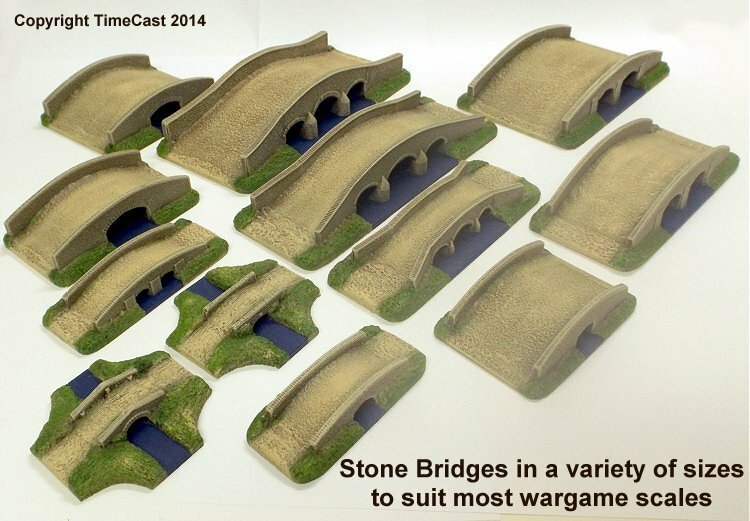 As an example, the Medium Water Course is ideal to use with 6mm figures as a wide river, as a narrow river for 10mm figures or as a stream for 15mm or 20mm figures. Please note that due to the nature of the latex material, which shrinks during manufacture, all measurements for latex items are therefore approximate. A ruler has been included in the photographs of the models for comparison purposes. TimeCast Flexible Terrain Features are manufactured without the use of release agents or other chemicals so there is no residue to wash off, however our workshop can be dusty place so we would recommend the models are gently washed in warm water with a mild detergent and allowed to dry completely before painting. TimeCast recommends the use of water based paints on these products. No primer or undercoat is required when using water based paints, you can paint straight onto the models and we have chosen to cast the models in an earth colour to make painting easier. Dry brush the whole of the surface with 537 Faded Khaki until you attain the desired base coat. Once dry using 506 Desert Sand dry brush highlights then allow to dry. Using 530 Russian green dry brush those areas of the verges you wish to have grass growing, this is then highlighted by mixing 146 Dusky Yellow with the Russian Green until you get the desired tone and then dry brushing. Alternatively highlight with 230 Camouflage Green. These are painted similarly to the Dirt Roads. Once the initial dry brush of Faded Khaki is dry paint the road surface with 212 Dark Grey and allow to dry. Lightly dry brush the cobbled road surface with Faded Khaki, then highlight the whole piece with Desert Sand. You should now have an road surface with a stone undertone covered in dirt and dust. The grass verges are then painted as the Dirt Roads. Dry brush the whole of the surface with 537 Faded Khaki until you attain the desired base coat. Once the initial dry brush of Faded Khaki is dry paint the road surface with 212 Dark Grey and allow to dry. Dry brush with a lighter grey or 537 Faded Khaki as desired. The grass verges are then painted as the Dirt Roads. The banks of the Water Course should first be painted in the same way as the verges of the Dirt Roads. Once completely dry paint the water surface with 110 Royal Blue. Before the Royal Blue has fully dried streak the surface with 148 Marine Blue. It may be advisable to slightly dilute the Marine Blue. The streaking process is the most tricky to get right and you may wish to practice before painting your models. Because of the nature of the Flexible Terrain it will not be possible to completely and permanently protect the painted finish of your models. You may however wish to try the Coat d'Arms varnishes, these are acrylic based and will retain a degree of flexibility when dry. These water based varnishes are easily applied with a brush are formulated to use with the Coat d'Arms acrylic paints. You should note that thick layers of varnish, particularly Gloss varnish on water surfaces is prone to cracking over time. There are a number of spray varnishes available from DIY and hobby stores that can be used to help protect your models. Please ensure your carefully follow the instructions on your chosen product. Once completed your Flexible Terrain features can be enhance by using Static Grass and flocks to add different foliage textures and tones to your models. These can be glued in to place by using standard PVA glue. Please note applying additional foliage will require a little extra care when storing your models. Although the Flexible Terrain models are made from a durable latex rubber material they will benefit from being stored carefully when not in use. TimeCast recommend the flexible terrain is stored flat. The materials used to manufacture has a “memory” and it is possible that items stored bent or with kinks may become permanently mis-shapen. To save space storing in layers is a good idea. However the layers should be separated with a material that will not cause damage to your models. We recommend sheets of bubble wrap. Extra care should be taken when storing terrain pieces that have been enhanced with Static Grass or flock.